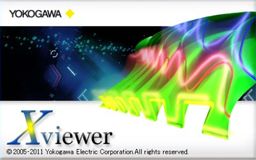 XviewerLITE is a free PC software application designed to work with Yokogawa DL series digital oscilloscopes and ScopeCorders. It allows you to display acquired waveform data on a PC. Zoom and history displays as well as vertical cursor measurement are also available. Additionally, binary waveform data can easily be converted to CSV(ASCII) format by using this software. Please refer to the Instruction Manual for features available on XviewerLITE. Xviewer is a PC software application designed to work with Yokogawa's DL series digital oscilloscopes and the DL850 series/SL1400 ScopeCorders. Xviewer allows you to display DL-acquired waveform (using the "Viewer" function), perform file transfers, and control DL series instruments remotely. Free version, XviewerLITE is also avaiable.